Georgette Gagnon, UNAMA’s Director of Human Rights; and Ahmad Fahim Hakim, Deputy Chairman of the Afghanistan Independent Human Rights Commission (AIHRC). Kabul – 9 December 2010UNAMA: Good morning. Thank you all for coming. Today’s launch of UNAMA’s human rights report: Harmful Traditional Practices and Implementation of the Law on the Elimination of Violence against Women in Afghanistan coincides with our celebration of International Human Rights Day, which is tomorrow 10 December. Every day, but on International Human Rights Day in particular, we commend the courage, commitment and dedication of all Afghan defenders of human rights and today we pay special tribute to those who defend the rights of Afghanistan women and girls. We are very pleased to have with us today the Deputy Chairman of the Afghan Independent Human Rights Commission, Ahmad Fahim Hakim, who himself and his group are the key defenders of human rights in Afghanistan. The report we are releasing today – and this is a very important point – represents the voices and views of Afghan men and women on harmful traditional practices. These include forced and child marriage, giving away girls to settle disputes under baad, honour killings and other forms of violence against women. The report describes the prevalence of these practices; it look at the consequences these practices have on the lives of Afghan women and girls and the community as a whole and it also looks at the efforts of the Afghan Government to address violence against women, in particular the Government’s implementation of the 2009 Law of Elimination of Violence Against Women. This law, also know as the EVAW law came into force in August 2009. It represents a huge gain of legal protection of women’s rights, because the law says customs, traditions and practices that cause violence against women, contrary to the religion of Islam, should be eliminated . The law makes it a crime to buy and sell women for marriage, to force a woman to marry without her consent, to force girls to marry when they are underage, and to force girls and women to commit self-immolation – when they set themselves on fire – and a number of other acts. Now this report that we are releasing today is based on extensive research, direct discussions, and interviews with Afghan men and women, religious leaders, and Government officials, in almost all of Afghanistan’s 34 provinces and it is also based on UNAMA human rights monitoring and the follow up of many, many individual cases of harmful traditional practices and violence against women. What were the findings of our report? First, almost all the Afghan men and women we spoke to said they know there are harmful traditional practices in Afghanistan and they identified practices such as child marriage, forced marriage, baad, honour killings and inheritance of widows, among some other practices. The second finding is these harmful practices are widespread, occurring in varying degrees in all communities – urban and rural – and among all ethnic groups and these practices have been worsened by more than 30 years of insecurity and poverty. The next finding is that these practices are rooted in discriminatory views and beliefs of the role and position of women in Afghan society and have caused suffering, pain and humiliation and marginalisation for millions of Afghan women and girls. And, of course, child marriage has lasting and damaging consequences for women and girls. They are often denied the right to health and education and this is reflected in the fact that Afghanistan has the worst maternal mortality rate in the world. Our next finding is that often women and girls have no escape from the violence they experience everyday. They suffer physical and mental abuse and many told us that other than running away they have no option but to take that violence. One very harmful practice that we heard a lot about is baad, which is the giving away of girls to settle disputes. Many of the women told us that instead of the murderer being punished, an innocent girl is punished and she has to spend all her life in slavery and subject to cruel violence. Sometimes she is forced to sleep with the animals in the barn. Now a little bit of good news is that inspite of the prevalence of these practices, our research, interviews and discussions indicated that many communities are opposed to these harmful practices. One Provincial Council member in the northern region said that these practices can change or decrease over time. People tend to oppose baad even in rural areas have understood the negative consequences and have begun to value female family members. Before I hand over to my colleague, one other key finding of the report is that many religious scholars and elders told us that many of these harmful practices are inconsistent with Sharia law. The role of religious leaders and community elders and to both continuing and ending these practices is critical. AIHRC [summarised from Dari]: My colleague has highlighted the main findings. It was actually appalling to see the malpractices and enhanced victimisation of the women in Afghanistan. But to focus on solutions—one of the key players in Afghanistan are the religious elders and the ulemas who can enhance their efforts and awareness-raising of their constituents in mosques and all other available means they have. Since we have been witnessing various patterns of violence against women, it causes young girls and women to leave their houses and commit suicide and self-immolation. These are the shocking consequences of not dealing with violence against women. Fortunately the implementation of the EVAW law is based on Article 54 of the Constitution to combat those practices that are violating women’s and children’s rights. The good news is that now the level of awareness of this issue is being put into practice. In the last couple of days we heard from the Ministry of Interior that they arrested the father-in-law of Bibi Aisha, the lucky victim, who was rescued. For sure we have hundreds of Bibi Aishas in Afghanistan. So, this clearly shows that now our national forces, particularly police, can distinguish to some extent between the victim and the criminal and how to treat them. Another point that I want to highlight is this misinformation about the effective role of shelters that emanates from a lack of awareness. Those women and girl victims of domestic violence who are forced to leave behind their homes—the only appropriate place for them is shelters not prisons. In the absence of shelters they are treated as criminals and put in prisons. We hope there will be an end to this since Afghanistan is committed to implementing the UN Millennium Development Goals. We hope this report enables the human rights support unit of the Ministry of Justice which was solely established to translate these recommendations into practical steps in terms of laws and official procedures. UNAMA: One quick point is that ‘running away,’ which was mentioned is not a crime under Afghan law. Yet half of the female prison population in the country is in prison for a moral crime such as running away. That is a shocking statistic. Finally we would like to say that in our view little meaningful and sustainable progress for women’s rights can be achieved in Afghanistan as long as women and girls are subject to these practices that harm, degrade, humiliate and deny them basic human rights. Ensuring the human rights of Afghan women is crucial, especially in this current peace, reintegration and reconciliation process and in their access to healthcare, education and employment. There are a lot of safeguards on paper but we all need to see much better implementation. Of course, the report makes a number of key recommendations to the Government, the police, religious community and international donors and we, the human rights community, are urging all these actors to move on these recommendations without delay to save the lives of women and girls. Thank you. RFE/RL: I wanted to know what you want the Government of Afghanistan to do to prevent violence against women in Afghanistan? Do your findings show that some Afghan law enforcement authorities are unaware of the Elimination of Violence Against Women (EVAW) law? Many of these officials are unwilling or even unable to implement the law. Why don’t you want to disclose the names of these officials? UNAMA: As you can see in the report there are 15 recommendations to the Afghan Government including the president. A couple of key ones are for the president to highlight continually that women’s rights are a priority in the peace, reintegration, and reconciliation process and also urging different Government authorities to implement the EVAW law quickly. Seven Government ministries have been tasked under the EVAW law. We are also calling on the authorities to consider ways and means to get these girls detained [for running away] released as quickly as possible. AIHRC: Regarding your question: why do we not name, I think in this regard there is a need to bring awareness of this issue up and that protection and defense mechanisms should exist. While administrative corruption and impunity is existing in some parts of the administration that could create an additional risk for victims. When these mechanisms are put properly in place then names could be disclosed. UNAMA: Regarding revealing in a public form the names of different officials who may not be acting properly under the law we have taken much of this information to the authorities we have done this in the areas with the local authorities and discussed getting some changes at those levels in addition, of course, to the highest level we have recommended that the Ministry of Interior, the police, the judges and the courts give out specific instructions, guidelines and supervise the activities of police in this area both at the local level and at the national level. Saba TV [translated from Dari]: Could you tell us the number or percentage of the increase of violence against women? And tell us the factors behind the increase of violence against women and how the Government is successful against violence against women? 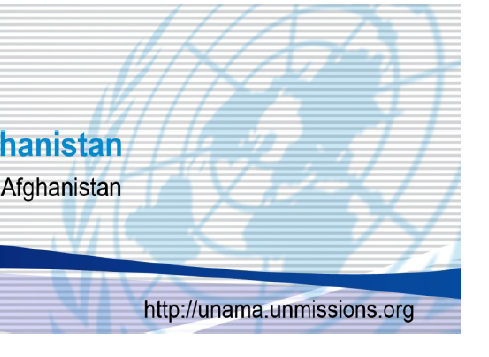 UNAMA: We don’t have a percentage per se. That’s not what is in the report. The whole report says clearly the reasons why this is still happening across the country. There are many factors and I have already described a number of them. The key thing is that those who are committing these practices must be brought to justice. And the communities that are letting this happen need to speak out. And we’ve indicated how they should do that. BBC: My question was on the last point you made regarding factors of violence against women. These factors are not new. This is not the first time we are hearing this. In the last seven or eight years we have seen many of these reports. Why are you not doing something practically to eradicate that and what has been done to eliminate this violence? UNAMA: What is new is that there is a new law that came in which is just over a year old. What is also new is that there have been some steps taken under the law to prosecute those who are committing these harmful traditional practices. What is also new is that many, many communities that we spoke to oppose them and many are working and to try and address the attitudes. But what is important is to keep highlighting that there is a problem. You have to keep highlighting issues like this and push to get them fixed. AIHRC: I highlight that civil society groups, Afghanistan Independent Human Rights Commission (AIHRC) and UNAMA are not executive bodies, but advocacy ones. They are doing advocacy work and raising the voice of the people. We are keen to enable the Government to fulfill its commitments. El Mundo: How many shelters are there for women in Afghanistan right now? You said that many women have any no option but to run away? UNAMA: Regarding the number of shelters there are not many shelters across the country and for a number of reasons – security reasons in particular – we don’t give out numbers. I can help you to find that exact information. The Elimination of Violence Against Women Law and the activities of the Department of Women Affairs at the provincial level are important. The law is designed to help women deal with violence in their home and communities and to get assistance through registering complaints with police and others and to go to shelters. The Department of Women’s Affairs has a key role in making this happen together with various women’s civil society groups. In terms of registering marriages one of our key recommendations if you looked at the report is that two people who are supposed to get married actually go to the registry office in person to be registered. This may be a way to deal with problems with very, very young girls who are getting married. That is addressed in our report. El Mundo: What about registering? AIHRC: This is not a common practice. This does happen in some cases. This is our suggestion to have it enforced. Unfortunately the new registration documents are not available to all. Sadly due to corruption and due to bureaucracy it’s time consuming. That’s why they revert to the old practices. That is another concern. Noorin TV [translated from Dari]: Yesterday we spoke with the Deputy of Minister of Women Affairs who rejected that the fact that there had been an increase in violence against women. She said women had become more aware to their rights. The other main factor is that women have been asked to register if they face any violence. Is that the only reason violence against women has increased? What’s your view on this? UNAMA: It is a very well known fact that once women feel they can report violence against women the number of reports go up. That’s a well-known fact and that’s a good thing because you want women to go to the court and to register their complaints, to get their complaints investigated and people prosecuted. Of course the concern is that there are many cases we have heard about where women do not go and register a complaint and who are unable to get out of the situation they are in and use other ways to deal with it like setting themselves on fire or running away. But as we said the good news is there is a lot more awareness that these practices are not only hurting women, but the community as a whole and there have been some steps to deal with them. Pajwok [translated from Dari]: With regard to the positive aspect of the decrease of violence against women, despite positive signs, why is the participation of women in the Government decreasing and what’s the main reason behind this? And about the implementation of the law of elimination of violence against women how do you think such law will be fully implemented in a country like this? UNAMA: The report says quite clearly that implementing this law could help to end violence against women, not end all violence against women. Obviously there are all kinds of things that the community and the young men in this room need to do to promote better the rights of women and girls and, as we said in the report, the religious community and religious leaders are really important in all of this. The report is at the side of the room. It is quite a long report but has got a lot of interesting things in it. I urge you to read every word about it. December 9, 2010 in Human Rights News, Women Rights.